About 300 km southeast of Seoul is the South Korean port city of Busan (부산). The city has so much to offer with its beautiful South Sea coastline, sandy beaches, mountains, as well as the fun of Korean food and culture—yet the city is under the radar of most western travelers. Many Koreans and Asian tourists come here to vacation, but the city is under the radar of most western travelers. Busan is South Korea’s second largest city, with about 3.6 million residents. Busan is the largest port in South Korea and the fifth busiest container port in the world. There are three major beaches in the city: Haeundae, Gwangalli and Songdo. Busan hosts many popular festivals, such as the Haeundae Sand Festival, the Busan Sea Festival, and the Busan International Film Festival (BIFF). The quickest and easiest way to Busan from Seoul is by KTX train, which takes less than three hours. 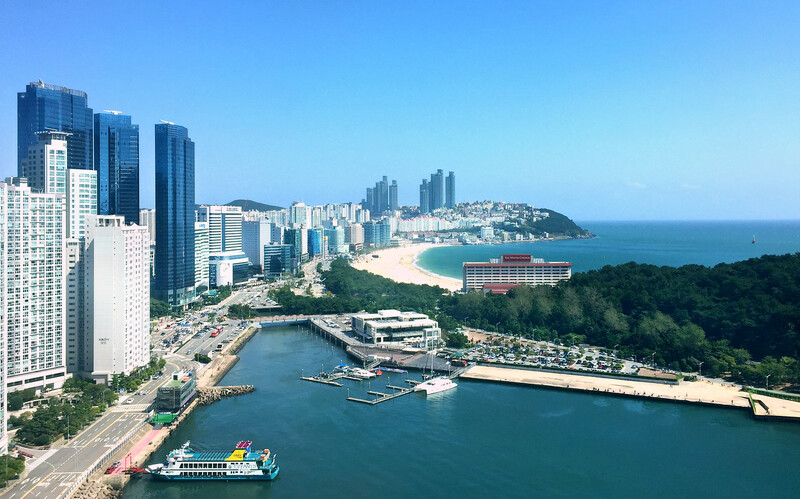 We recently spent some time in Busan, and here are some of our best experiences. Haeundae’s 1.5 km strip of golden sand is the most famous beach in South Korea. There are numerous hotels, guest houses and restaurants right across the street, and if you visit there’s a good chance you’ll be staying in this area. Chuseok is an important family holiday, so many vacationers were families, and the beach quieter than usual. During high season Haeundae’s sandy beach is covered with umbrellas, and has even achieved a Guiness World record in that category. We visited in the shoulder season near the end of September, during Chuseok (Korean Thanksgiving), when it was much quieter. The weather was beautiful, and still warm enough to walk along the water’s edge. The beach is clean and safe to visit both day and in the evening. ▶ Getting there: Subway Line 2 to Haeundae Station (Exit 5), then it’s about 500 metres to the beach. 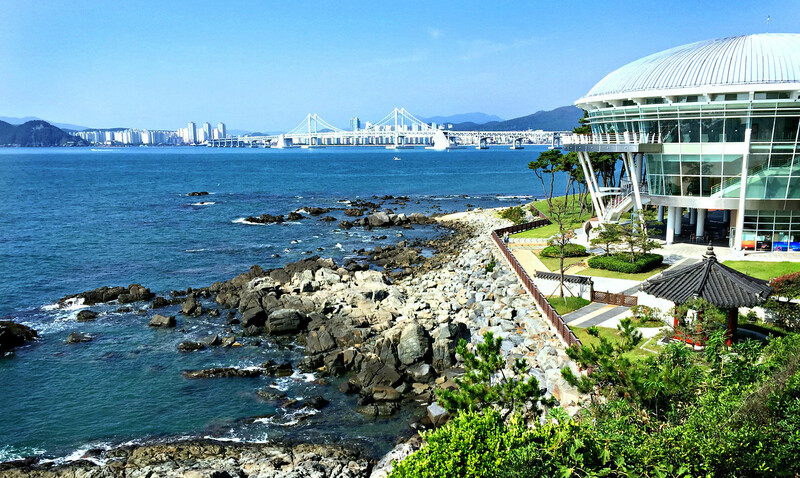 Right on Haeundae beach is the Sea Life Busan Aquarium, which is much bigger than it looks and spread over 3 underground levels. It is home to more than 35,000 species of fish, algae, reptiles, and amphibians. The aquarium is known for its conservation work including the rescue and release of sea turtles. More information and discounts are available on their website. The magical night view of Haeundae Beach from our Airbnb apartment. We headed to the beach and ate our picnic watching others setting off fireworks towards the sea, then set off our own. A fun place for lunch just across the street from the beach is the Haeundae Market. Along with the fresh vegetables, seafood and kimchi are inexpensive restaurants and stalls selling street food. We had some excellent dumplings in a small restaurant. The walkway around Dongbaek Park. 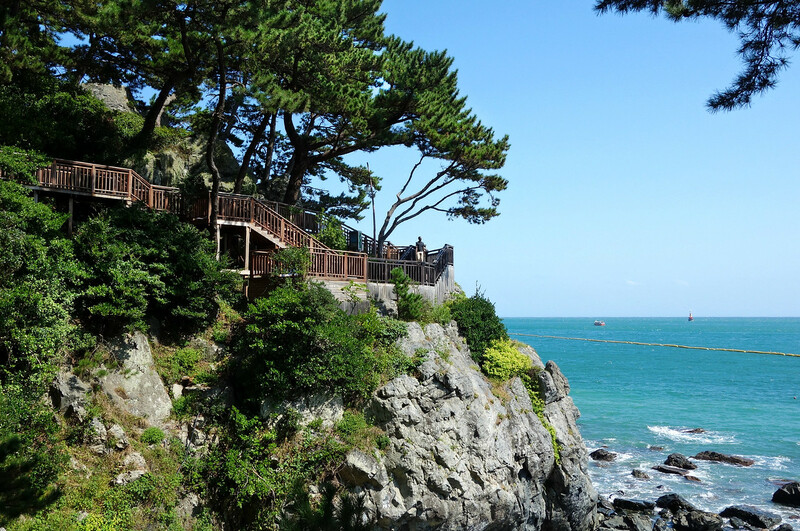 Dongbaek is a lovely park next to Haeundae beach on a rocky island forested with evergreens and camellia trees (dongbaek in Korean). Although it is still called an island, Dongbaek is connected to the mainland as the waterway was silted in many years ago. There is a walkway that circles the whole park with beautiful views up and down the coast. 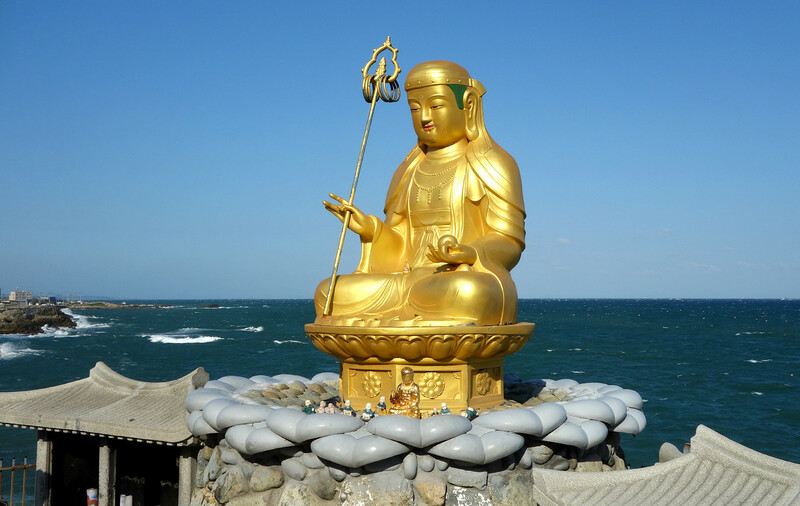 At the top of the island is a statue and a monument of Choe Chi-Won, a ninth century scholar and poet, who carved “Hae un dae” in the rock, thus naming the area (which means sea and clouds). The park is very popular in the morning with people out walking or using the exercise machines along the pathway. At the tip of the park is APEC House, a modern building which was used for the APEC Summit Meeting in 2005. It’s open to the public 9:00-18:00 and worth a quick look, but the main attractions are the awesome views and the park itself. ▶ Getting there: Subway Line 2 to Dongbaek Station (Exit 1) walk 800m towards the Busan Westin Chosun Hotel, which is at the start of the park. 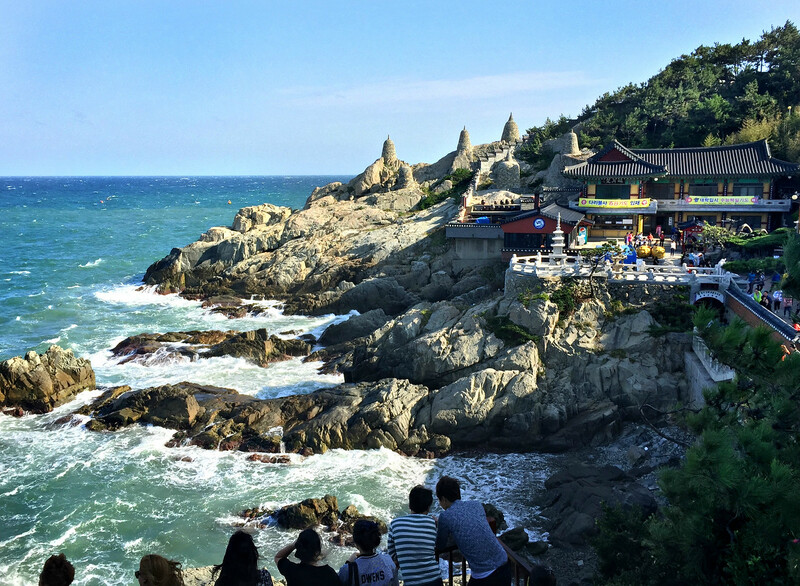 Haedong Yonggunsa is a beautiful temple first built in 1376 in a unique coastal setting. It’s a top tourist attraction in Busan, so there are lots of people, and lots of booths selling snacks and souveniers. The beautiful temple and spectacular setting are worth the visit in spite of the crowds. 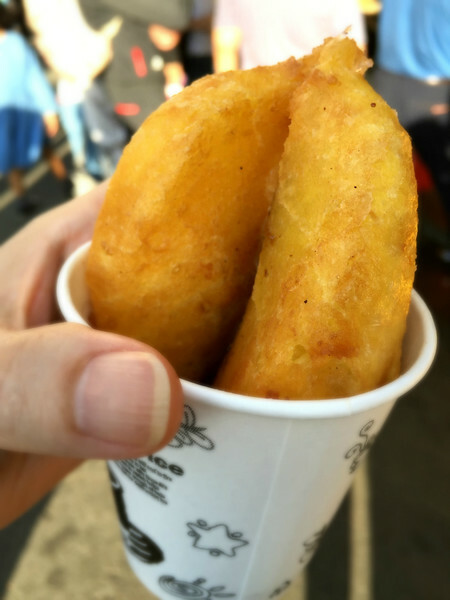 Go early if you can and grab a piping hot Hoddeok (pancake) from a food stall to munch on as you take it all in (try not to burn your mouth on the delicious melted brown sugar filling). The temple area can all be seen in an hour or so. ▶ Getting there: Subway Line 2 to Haeundae Station (Exit 7). Then take bus 181 and get off at Yonggungsa Temple. Or take a taxi about 15 minutes from Haeundae. ▶ Open Daily 04:00 – 19:00. 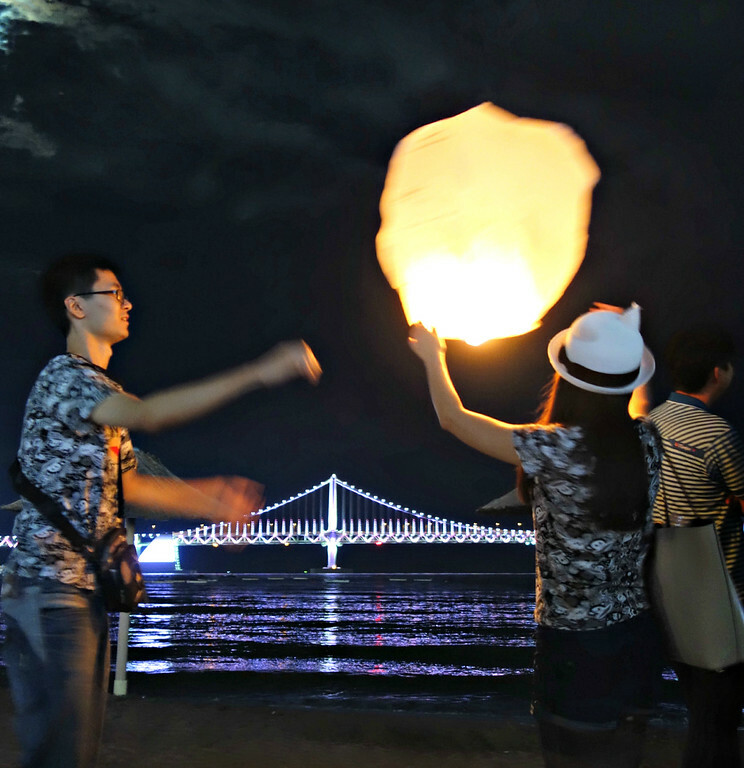 Along with the Gwangan bridge lights several people also lit paper lanterns that rose over the sea into the night sky. Gwangalli beach is famous for it’s fine sand, clean water and romantic night atmosphere. The focal point is the Gwangandaegyo Bridge (also called the Gwangan Bridge or Diamond Bridge), which stretches over 7.4 km and is the largest ocean bridge in South Korea. The bridge sparkles at night with 100,000 lights that change colors making it especially beautiful. ▶ Getting there: Subway Line 2 to Gwangan Station (Exit 3 or 5). It’s about a 5-minute walk to the beach. Gwangalli seafood BBQ (jogae gui) with pork belly. 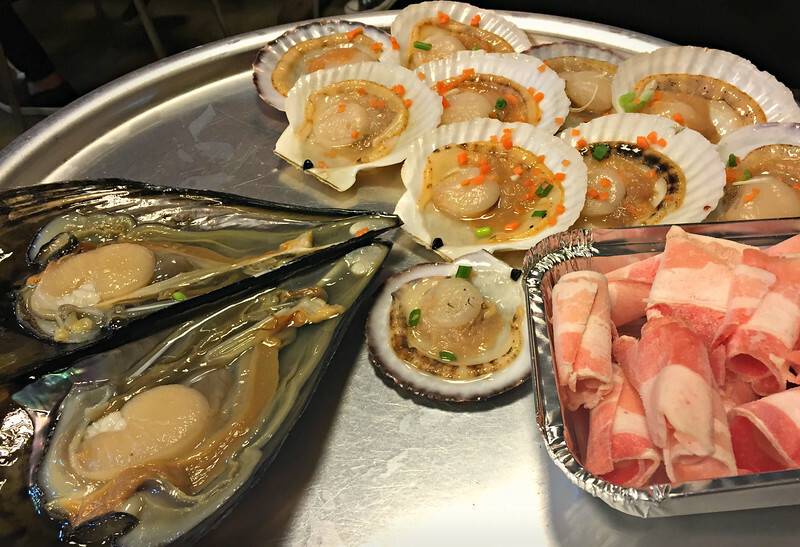 After your evening stroll, Gwangalli is a great place to try a seafood bbq called jogae gui (baked clam). There are many options at the east end of the beach. Like other Korean bbq places there are vents hanging down over the centre of the table above a grill. Red hot coals are placed under the grill and you cook your own meal. With the shellfish comes foil containers of enoki mushrooms, kimchi, and shredded cheese to cook over the grill with the shellfish. So good and a great Busan experience! ▶ Check the Shinsegae website for more info. Korea is a very creative place, with a lot of interesting architecture and design. If you enjoy art, the Busan Museum of Art is a great place to spend an hour or two, and near the Shinsegae department store. They have an interesting collection of Korean modern art as well as contemporary pieces from throughout Asia. We especially enjoyed an exhibit by Busan-born artist Kim Tae Ho. ▶ Check museum website for current exhibitions. ▶ Admission free, except for special exhibitions. ▶ Getting there: Subway Line 2 to Busan Museum of Art Station (Exit 5), then walk about 100 metres to museum. Taxis are reasonable for short distances in Korea, but don’t expect your driver to read or speak English. It will help your driver to have a map of your destination and the address in Korean. Have you been? What are your favourite things to do in Busan?